Mood Smart Wallets conveniently hold your ID cards, credit cards and cash securely attached to the back of your cell phone. Print your custom design or message on these Mood Snart Wallets where they will always be seen. These attention grabbing Mood Smart Wallets change colors simply by the heat of your hand. Mood Smart Phone Wallets are available in blue changing to white, purple changing to pink, green changing to yellow, orange changing to yellow. Standard Imprint Colors provided at no extra charge: Black, White, Red, Lt. Blue, Med. Blue, Dk. Blue, Lt. Green, Med. Green, Dk. Green, Brown, Purple, Yellow, Teal, Orange, Maroon, Gold, Athletic Gold, & Silver. BLACK IMPRINT IS RECOMMENDED on our Mood Smart Wallets. 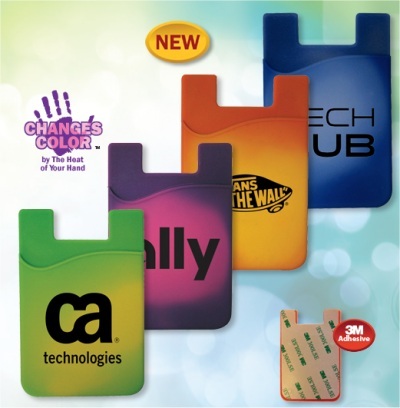 Mood Smart Wallets are 2-1/4" wide x 3-1/2" high with an imprint area of 1-1/2" wide x 1-3/4" high.